You shouldn’t wait for an infestation to have pest control performed at your home. This is especially true for termites, which pose a threat to the structural integrity of your residence. Even if you don’t see pests yet, that doesn’t mean they aren’t there. 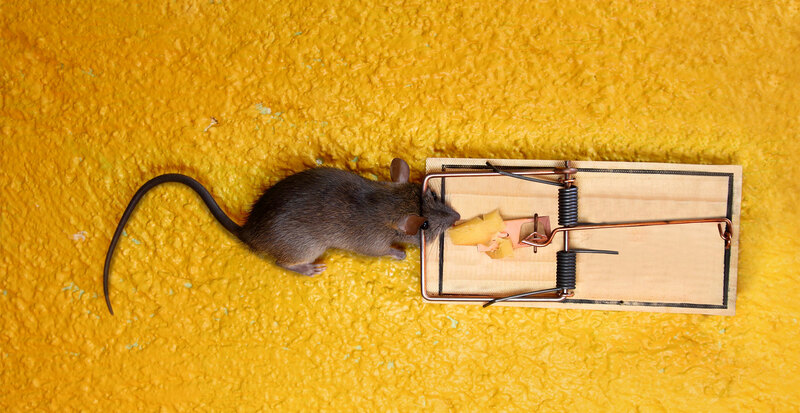 For those of us who grew up on the classic Saturday morning cartoons, the image of cheese (often swiss) placed in a mouse trap was often the choice for tempting rodents to their early demise (Tom and Jerry, anyone?). There are better ways to bait them. Also consider this: If you are tempted to use a mousetrap, and you have pets or small children, you may be putting them at risk. You can help lower your chances of rodent infestation by taking certain precautions, such as sealing any small external crevices where mice can make their way inside. Keep clutter to a minimum, store food tightly, and clean kitchen counters. The best ways to rid your property of mice are methods administered by trained pest control professionals. While maintaining a clean home can be important for many pest control issues, it does not apply to bed bugs. They are attracted to the warmth provided by your indoor space, particularly bed linen. We’ve all been told “don’t let the bed bugs bite”… and that’s just what they do. Since their diet consists exclusively of blood, they are as happy as a bug in a rug… whether it’s dirty or not! This is one of the odder myths that have floated around. The theory is that ants eat the dry corn grit, then when they drink water, the grit expands and explodes the ant. Hold off on those visions of ant fireworks in your head! Since adult ants cannot ingest solid food, this is not possible. That buzz you keep hearing in your electronic insect killer may give you some satisfaction, but it will be short-lived once you realize that those zaps aren’t mosquitoes going down for the count. You may kill some mosquitoes, but you are much more likely to be doing the exact opposite of what you intend. A Notre Dame University study found that mosquitoes only comprised 4 to 6 percent of the dead bugs zapped by these backyard devices. Even worse, those people were bit 10 percent more than people who didn’t have a zapper. That’s because the device attracts mosquitoes but did not kill most of them. Pest Control vs. Exterminator: What’s the Difference? What’s It Like To Be A Portland Exterminator?